You don't have a checking account, much less a personal Black American Express Card. No fake ID, either--not that you'd pass for twenty-one in a million years, even if you did. The only courtier in your closet is a Halloween costume your mom made out of an old laundry bag when you were eleven. You've never been to a club or had a drink served in a martini glass, or frankly, done anything really NYC-ish at all. You definitely don't have any secret powers, or friends who are vampires, or magical weapons stored in your parents' basement. You're about as normal and totally boring as a human being living in the most exciting city on the planet could possibly be. In other words? You're me: Kelsey Finkelstein. But don't despair people--I'm starting high school in less than a week! This is going to be the year that I live up to all of my untapped potential--finally. I have to say... I'm feeling optimistic. Review: The summary of this book says it all when it mentions all the things Kelsey is not: vampire, etc. She is just a "typical" freshman, meaning she has crushes, goes to school, has good friends (with whom she has fights), she is jealous, plays a sport, gets embarrassed, and is just trying to navigate through freshman year the best she can. How awesome is that?! I really had fun reading this book; it was refreshing to read a YA where the characters' problems are so similar to mine rather than it all being so fantastically strange that it couldn't possibly be true. Kelsey has a group of good girl friends who do everything together (so did I), at one point a boy comes in between two of them (I still have awful memories of dating my friend's Homecoming date even though at the time I convinced myself it was okay since I "really, really liked him"), she plays soccer and is forced to play goalie (I had to swim the 500 freestyle a couple times, not my favorite event by far! ), one of her friends finally admits she's a lesbian (yep, this one too), and Kelsey's mom "invades" her life (yes, my mother still likes to know all the details). 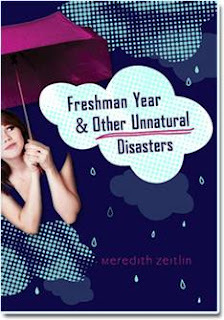 As a freshman the main character goes to parties and drinks and she also drinks at her friends' houses. It's too bad that had to be included, but it is reality. However, one of her friends goes to parties with them but doesn't drink. And, the best part? No one rags on her for it. And the drinking plays a minor-ish role rather than being a big focus of the book. That's good. It's realistic without glorifying alcohol. This book is fun, funny, touching, and a really quick read. Thank you to the publisher for giving me a copy, I am going to add it to my library collection at work and I am sure the students will really enjoy reading it.